This book provides knowledge and guidance to valuation practitioners on achieving a new level of professionalism and credibility, as well as to those stakeholders in the valuation process in need of assessing the credibility of an appraiser's work product for decision-making purposes. It introduces a well defined framework of key credibility concepts and procedures at each step of the appraisal process, including reasonableness tests, valuation methodologies, financial analysis, economic and industry analysis, engagement planning, and informed judgment. 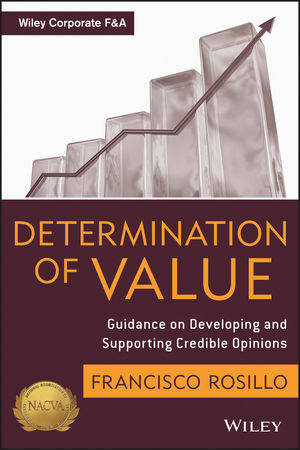 Get foundational framework appraisal advice with the proven guidance found in Determination of Value. Francisco "Frank" ROSILLO, CPA, ABV, ABAR, CBA, CVA, CFE, CFF, CFFA, is the managing director of the Valuations and Forensics Advisory, LLC. Serving an international clientele, the firm provides business valuations, mergers and acquisitions transactions, and forensic accounting advisory services. Rosillo is a frequent national lecturer and trainer in valuation and forensic accounting topics. He has authored Institute of Business Appraisers (IBA) and National Association of Certified Valuators and Analysts (NACVA) courses and the practice aid, Business Appraisal Review. Frank also teaches a five-day NACVA Appraisal Review Workshop and is a member of the Board of Governors of the Institute of Business Appraisers. He has been the recipient of several CPA accounting professional awards in business valuations and litigation support. His financial expert witness experience includes cases in federal and state courts.